Peter Dickson’s dream of establishing Australia’s first LGBT (lesbian, gay, bisexual, transgender) residential village in country Victoria came from a deeply personal motivation. “At a dinner party 28 years ago we talked about what we were going to do when we get old. We talked about being surrounded by friends and not being alone and isolated and forgotten about,” he says. That dream is becoming a reality, with 10 contracts signed and hundreds more expressions of interest flooding in for Linton Estate, being marketed to the LGBT community as “a place to truly be you”. The village is a short stroll from the centre of Ballan, a small town about an hour out of Melbourne between Ballarat and Geelong, and just 20 minutes’ drive from the popular gay destinations of Daylesford and Bacchus Marsh. Dickson says Ballan is the ideal place for such a development because it has a modern hospital, rail access to Melbourne, a meals on wheels service and an appealing local shopping strip. The town has the quaint feel of a sleepy bohemian retreat with a sprinkle of cosmopolitan cafe culture and a number of op shops dotted along the main street. 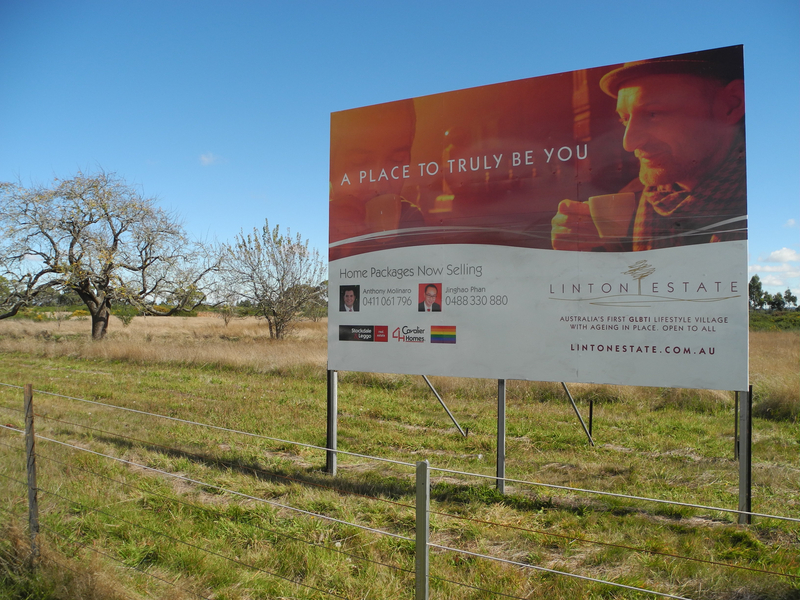 Linton Estate is being marketed to the LGBT community, but it will be open to all. Dickson compares it to religious retirement villages that are run by the Catholic church, but welcome non-Catholics as residents. Dickson says it will have more the feel of a retirement community, with fewer restrictions than a standard retirement village. It is part of a growing international trend of gay people wanting to find a friendly community in which to grow old – other LGBT retirement homes have recently opened overseas, including Triangle Square in LA and Regnbågen block in Stockholm. A new LGBT aged care centre is in the pipeline in the popular gay district of Prahran in Melbourne, developed by Lifeview Residential Care with the support of the Prahran City Council. Chris Straw, a Melbourne architect specialising in accommodation for older communities, says he views the movement as a subset of a broader trend of niche centres aimed at bringing together likeminded people in their older years. “We are increasingly finding that globally a lot of the boutique facilities have a compelling story attached to them,” he says, citing an aged care home in Melbourne that caters specifically for the arts community. Linton Estate will offer six-star resort facilities including a gym, 32-metre pool, wet and dry sauna, bar, restaurant and library. It has a focus on environmental sustainability, with solar street lighting and grey water systems. Prices start at about $400,000, although Dickson hopes to add a one-bedroom option at about $300,000. Research from the Stonewall Foundation in the UK suggests elderly gay and lesbian people are almost twice as likely as their heterosexual peers to expect to rely on medical, housing, care and home help services. However, they often struggle to find providers who will understand their needs. The gay rights activist and academic Rodney Croome says such facilities can help quell the prejudice faced by aging members of the LGBT community. While acknowledging not everyone will be able to afford to live at Linton Estate, Dickson says he thinks such developments will help stem the invisibility often felt by an older generation of LGBT people. Ballan local Elizabeth Ivchenko says that while there has been some opposition from a small group of religious people in the area, the town has generally embraced the arrival of Linton Estate.